OPC – History OPC (OLE for Process Control) is an industry standard created with the collaboration of a number a leading worldwide automation and hardware software suppliers working in cooperation with Microsoft.The organization that manages this standard is the OPC Foundation.The Foundation has over 150 members from around the world, including nearly all of the world’s major providers of control systems, instrumentation, and process control systems. The OPC Foundation’s forerunner — a task force composed of Fisher-Rosemount, Rockwell Software, Opto 22, Intellution, and Intuitive Technology — was able to develop a basic,workable, OPC specification after only a single year’s work. A simplified, stage-one solution was released in August 1996. The objective of the OPC Foundation is to develop an open, flexible, plug-and-play standard that allows end users to enjoy a greater choice of solutions, as well as sharply reducing development and maintenance costs for hardware and software suppliers. The OPC Foundation has been able to work more quickly than many other standards groups because OPC Foundation is simply building on an existing Microsoft standard. Other groups which have had to define the standards “from the ground up” have had a more difficult time reaching consensus as a result of the scope of their work. Microsoft is a member of the OPC Foundation and has given strong backing to the organization. However, Microsoft has been careful to remain in the background and let the member companies with direct industry experience guide the organization’s work. One of the most valuable aspects of Microsoft’s participation is the fact that it hosts an annual OPC Foundation meeting in Redmond,Washington (Microsoft Headquarters) to provide Foundation Members with a preview of coming developments in OLE/COM and other Microsoft technologies. Many Foundation Members are small companies and would not receive that kind of briefing from Microsoft if they were not Foundation Members. End-Users are encouraged to join OPC Foundation, and several manufacturers actively participate in the specification and technical review process. Both End – Users and Automation Suppliers benefit from having a standard. For every automation system installed today, there is a significant amount of time and money spent on integration. OPC ensures that automation systems can share information and interoperate with other automation and business systems across their plant or factory. COM – What is it? OLE – What is it? OLE Automation – What is it? DCOM – What is it? ActiveX – What is it? DDE – What is it? OPC – With the DCOM, how does it handles the remote server being disconnected problem? One of the strong points of OPC is that it leverages other standard software technology like Microsoft ActiveX, DCOM, and Windows NT. Microsoft DCOM technology makes distributed, client/server networking transparent to the OPC application. DCOM makes the underlying network communication protocol transparent to the OPC client/server. DCOM may send OPC messages using a variety of transports such as UDP,TCP/IP, and IPX, using the same OPC application using DCOM. OPC – Can OPC implement safe shutdowns? OPC does not directly specify any type of shutdown mechanism or requirements of a client/server to provide this type of functionality. OPC servers and clients can exchange messages that contain shutdown commands.These commands can be interpreted and implemented by the control logic running in the software and hardware control devices that are connected to OPC. 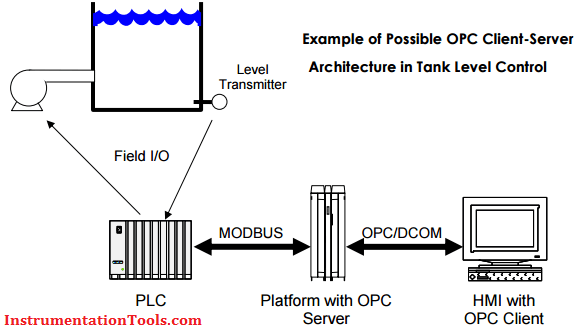 an HMI/SCADA’s Database may be a client application that connects to an OPC sever. In engineering software, Application Programming Interface (API) is a set of software functions used by an application program as a means for providing access to a specific application or operating system’s capabilities. Many OPC Servers offers API for user. This is good stuff to get depth knowledge of OPC. Also Read: What is OPC ?